Today is the second annual SABR Day, which is an occasion for celebrating the work of the fantastic Society for American Baseball Research. 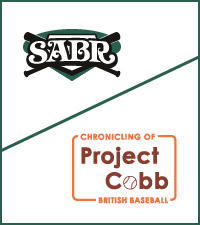 Project Cobb (the Project for the Chronicling of British Baseball) had been counting down to this day for the past 10 weeks with a series of Cobbettes on BaseballGB that travelled backwards through the decades of the 20th Century. Today we have reached the 1890s, which was the first decade of structured domestic baseball on British soil. The feature published today acknowledges the fundamental link that exists between keeping score and baseball’s historical record. Without the attention given to the former in baseball’s early days the latter would be very sparse indeed. In addition, it is worth noting that Project Cobb grew out of the Great Britain Baseball Scorers Association. History and scoring really do go hand in hand. The scoresheet used in Britain’s pro baseball league of 1890 was a fairly basic one, as illustrated by the example above from a game played at Deepdale. Base hits were recorded with a long vertical line intersected with as many short horizontal lines as bases were made. Put-outs were recorded with a description of the out above the number of the out in the inning. The description contained: for a ground ball out, the line-up spot for the player making an assist and the player making the put-out, with the two separated by a hyphen; for a fly-ball out (“F#”) or foul fly-ball out (“FO#”), the line-up spot of the player taking the catch; and for a strike-out (“K#”), the line-up spot of the catcher, to whom the put-out would have been credited. Because the line-up spot was used to described fielding plays rather than the positional shorthand (e.g. “6” for the shortstop), it is necessary to refer to the other team’s batting order to decipher what happened on put-outs in balls on play. The Preston North End line-up is supplied below. Other abbreviations used on the scorecard included “B” for a base on balls, “H” for a hit batter, and “E” for an error. A dot showed that a player came round to score while a ringed number indicated the base on which a player was left at the end of the inning. Finally, outs constituting a double-play were joined by a curved line. The 1895 scoresheet comes from a game played at Crystal Palace between a London Consolidated squad and a touring Boston Amateurs team. In the 1895 system, an “x” in the diamond in the centre marked a run being scored. Dots represented a base hit, with a number of dots corresponding to the base entered into each square for every base reached on the hit. So a home run would have one dot in the top-left, two in the top-right, three in the bottom-left, and four in the bottom-right. Advancement on another batter’s ball in play was marked with an “X” in the relevant square or squares, but if the base was stolen an “S” was used instead. Other abbreviations used were “B” for a base on balls, “H” for a hit by pitch, “WP” for a wild pitch, “P” for a passed ball, “S-O” for a strike-out, “FT” for a foul tip, “WT” for a wild throw, “TI” for a “throw-in” (presumably an advance on a throw), “SH” for a sacrifice hit (for both batters and runners), “F” for a fly-out, and “FF” for a foul fly (“2FF” was a pop-up behind the batter to the catcher, for instance). As it the case today, positional shorthands were used to describe put-outs on balls in plays. Nevertheless, it may be of interest to readers to see the Boston Amateurs’ line-up from the game. Also, it is worth pointing out that, according to accompanying usage notes, “5” was used to signify the shortstop and “6” the third baseman – the opposite is true today, of course. This is particularly interesting given that the explanation that is often given for the shortstop being given number “6” rather than “5” is that in baseball’s early days the player used to be considered as the bridge in the gap between the infield and the outfield, and hence the third baseman received the next number in the sequence after the second baseman. Over the course of the 1890 pro league, not a single substitute was brought into a game, although the introduction of substitutes into baseball’s rules had recently occurred (it was limited to two in that particular year). As such, the scoresheet for 1890 does not leave room to accommodate substitutes. If you want to use it for a game today, you may need to write the names and positions a bit smaller, so as to leave room for changes of personnel or fielder placement. The evolution of baseball’s use of substitutions is clear by comparing the two sheets featured in this article. By 1895, it was permissible to bring in more than two new players during the course of a game, and while squads were much smaller than they are today, the fact that the use of substitutes was becoming more engrained in the game is evident from the existence of a second row for names in each batting order spot on the scoresheet from 1895. The scoresheets from 1890 and 1895 reproduced in part in this article were taken from books published in 1891 and 1896. Consultation with British Library staff has indicated that these are probably now out of copyright. If you believe this not to be the case, please leave a comment below and they can be removed from the article.